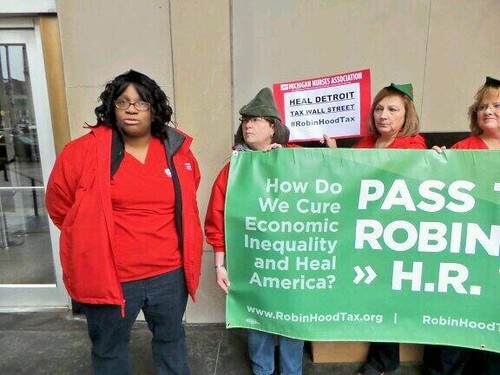 From Maine to California, nurses, students, HIV/AIDS and community activists, took to the streets today calling on Congress to fulfill the quest of Dr. Martin Luther King Jr.’s fight for economic justice by enacting a tax on Wall Street speculation to fund efforts to reverse inequality. "This is a holy day, a sacred day," Ellison continued. April 4 is a day America remembers Dr. Martin Luther King Jr. It was on this day 46 years ago that he was assassinated, slain while in Memphis to provide support to city sanitation workers as part of a campaign for worker justice and to fight poverty. 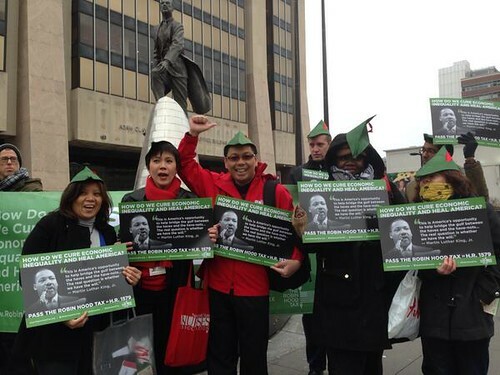 Vigils to honor Dr. King’s legacy, and call for enactment of HR 1579 were also held at Congressional offices in 24 cities from coast to coast, and letters of support delivered to Congress members at 44 other offices this day as well. In Washington, Bill Lucy, president emeritus of the Coalition of Black Trade Unionists, who was with King in April, 1968, stood today outside the Capitol with Ellison remembering King and calling for passage of the Ellison Bill. 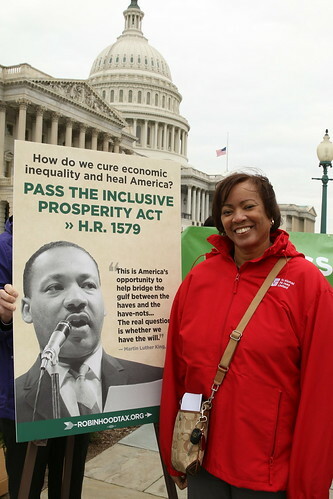 "The Inclusive Prosperity Act really is a vehicle to continue the work of Martin Luther King Jr.," said Lucy. "The sanitation workers of Memphis wanted decency and dignity," he remembered. 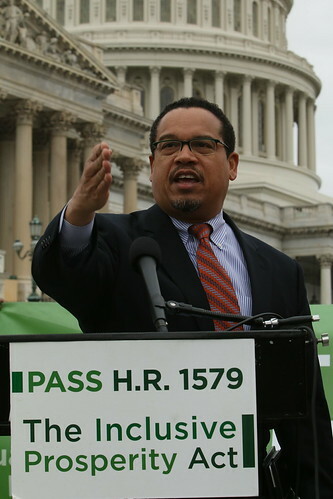 "Keith Ellison wants economic fairness. I applaud him." 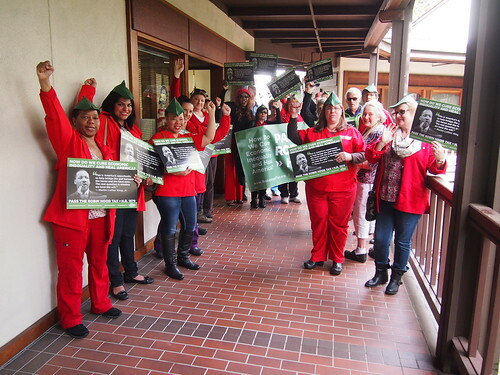 "The originators of the idea for the tax are nurses," said Ellison, introducing Sandy Falwell, RN, a national vice president of National Nurses United. "America is our patient," declared Falwell. 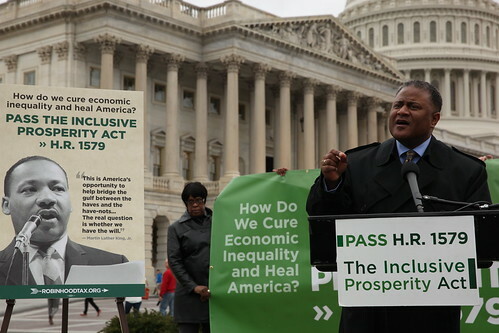 "The Inclusive Prosperity Act is a vital step to funding programs Dr. King stood for." Falwell and others talked of jobs to rebuild a crumbling infrastructure, quality schools and healthcare, retirement with dignity, funds for a clean environment, all goals of the H.R. 1579. "We will push this forward. 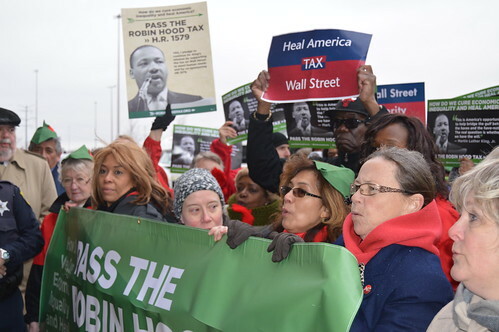 The Robin Hood Tax is real hope for a just economy," added Rep. Barbara Lee, a co-sponsor of HR 1579 who was also present outside the Capitol to remember Dr. King this day. "The American dream," she warned, "is turning into an American nightmare." In recent weeks, investigations of high speed trading on financial markets have underscored the negative effects these trades have on the U.S. economy. The Wall Street Journal reported in March that high speed trading programs "can encourage traders to engage in strategies that boost volumes but harm other investors." High speed trades are also linked to price rises in gas, food and other essentials. H.R. 1579, say economists, will serve to diminish this harmful trading. That was echoed at today's press conference. Said Ellison, "H.R. 1579 will make super fast trades unprofitable." Reverend Rodney Sadler was present, as well. A leader of the "Moral Mondays" in North Carolina, he spoke of the struggle for justice in that state. "Will we allow the poor to be overlooked, forgotten and invisible?" asked Sadler. "Prosperity is something that should be inclusive. The Inclusive Prosperity Act will go a long way to meet needs in housing, employment, education, for veterans and for the elderly." Amanda Lugg came to the event from Harlem where she is director of advocacy for the African Services Committee. She is also a board member of Health GAP. H.R. 1579 is committed to raising U.S. contributions to international efforts to research and treat HIV/AIDS. "We can end the AIDS epidemic in 30 years," said Lugg. "Half the people who need AIDS medicine go without. That ain't right." 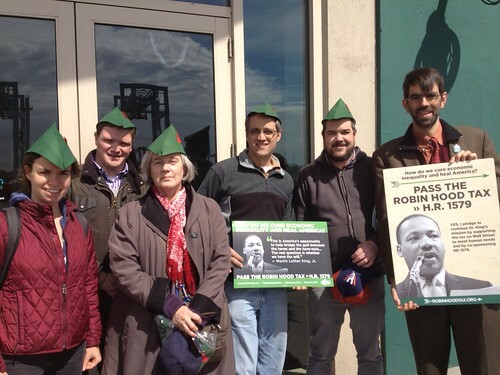 "The Robin Hood Tax," Lugg said, "can save lives and restore human dignity." She reminded the press conference that, for 11 nations in Europe, next month is the start date for their Robin Hood Tax. The time to join in is now.